I found the recipe in Family Circle magazine (I don't have any other information about the actual issue because I cut out the recipe and tossed the rest). So anyway, I think it's safe to share. Doubt you will be disappointed, so so good! 1. cake: heat oven to 350 degrees. grease a 13x9x2-inch baking pan with nonstick cooking spray. 2. combine egg, oil and buttermilk in a small bowl. in a large bowl, whisk together the flour, sugar, cocoa, and baking soda and salt. beat egg mixture into dry ingredients; continue beating until well blended. slowly stir in the hot coffee. 3. place mixture into prepared pan. bake at 350 degrees for 30-35 minutes or until toothpick inserted in center comes out clean. cool on wire rack. 4. topping: mix sugar and milk in heavy saucepan until sugar is dissolved. add butter and bring to a boil. remove from heat. place chocolate chips in a bowl; pour hot mixture on top. stir until smooth. 5. spread warm chocolate topping over cooled cake. drizzle caramel topping over frosting; sprinkle with crushed pecans. per serving: 478 calories; 24 g fat (7 g. sat. ); 5 g protein 67 g carbohydrate; 3 g fiber; 430 mg sodium; 24 mg cholesterol. personal note - baking the pecans was too long for mine. just put them in and keep checking them. wing it. hope you love it. enjoy! p.s. 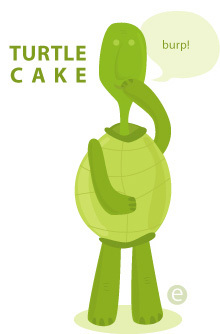 - turtle cake gets its name from a candy. the candy is usually caramel with pecans in it and the cluster is coated in chocolate. and that, is called a turtle. p.p.s - if you make it, please write me and let me know how it turned out.